When using this topic, please do not link to or post illegal server content. Also linking websites that promote illegal servers such as RMS is not tolerated. One of the seven spells possessed by Jilant. he turned into a devil spear that loses his life only by touching it. A striped uniform that any prisoner will wear. There are some blood spots here and there, but they are old and faded. Hit + 1 per upgrade level of the item. Flee + 1 per upgrade level of the item. Additional Atk + 1 per upgrade level of Shackles. Introduces new items. I guess they're from 16th anniversary event. Reduces damage taken from players by 1%. Reduces delay after skill by additional 2% per refine rate. If refine rate is 10, gains permanent Endure state. If refine rate is 7 or higher, reduces casting time by additional 10%. If refine rate is 9 or higher, reduces casting time by additional 10%. When equipped with Main Memory, reduces casting time by additional 20%. When equipped with Vesper Card, ignores magic defense of boss monsters by 70%, increases holy and neutral property magical damage by 30%. When equipped with Beelzebub Card, increases casting time by 30%. Atk + 40, increases critical damage by 5%. If base Luk is 90 or higher, additional Atk + 60, increases critical damage by additional 10%. If base Luk is 125 or higher, additional Atk + 80, increases critical damage by additional 20%. Increases Crimson Rock, Judex and Hell Inferno damage by 3% per refine rate. Matk + 25 and Cri + 5 per refine rate of Chivalry Shoes. Int + 3, Dex + 3. Edited by Sigma1, 07 December 2018 - 10:02 AM. Rebels need some good (endgame) headgear. Increases Dragon Breath - Water and Dragon Breath damage by 50%. Increases long ranged physical damage by 2% per each level of Dragon Breath user learned. Reduces delay after skill by 2% per each level of Dragon Breath - Water user learned. reduces delay after skill by additional 5%. A very rare breed of dragon that has red color. Increases damage of [Dragon Breath] and [Water Dragon Breath] by 15%. Refine level +6: increases damage of [Dragon Breath] and [Water Dragon Breath] by 15%. Refine level +8: increases damage of [Dragon Breath] and [Water Dragon Breath] by 15%. Reduces damage taken from players by 7%. If refine rate is 7 or higher, attack speed + 10%, reduces delay after skill by 10%. If refine rate is 8 or higher, armor can't be destroyed. has a chance to auto-cast Heal level 5 to the wearer when receiving physical or magical damage. If refine rate of Celine's Ribbon is 7 or higher, increases magical damage against boss monsters by 15%. If refine rate of Celine's Ribbon is 9 or higher, increases magical damage against boss monsters by 15%. MaxHP + 3%, MaxSP + 3%. If refine rate is 7 or higher, MaxHP + 7%, MaxSP + 7%, ASPD + 1, recovers 5 SP when killing monsters with physical damage. If refine rate is 8 or higher, increases movement speed. If refine rate is 9 or higher, MaxHP + 10%, MaxSP + 10%, ASPD + 1, recovers 5 SP when killing monsters with physical damage. If refine rate is 10, enables to use Cloaking level 3. Ignores defense and magic defense of all race monsters by 50%. If refine rate is 7 or higher, All Stat + 10. If refine rate is 9 or higher, All Stat + 10. Edited by Sigma1, 11 December 2018 - 02:40 AM. They really phoned it in with those shoes eh? "whatever, just give a ton of stats lol"
Can we get Armor of Tatenashi before the Fafnir Scale kills Tao and this? Also, Can we have the ATK/MATK costume enchant stones for lower costumes? Edited by Yugacky, 11 December 2018 - 09:52 PM. Edited by toffee56, 12 December 2018 - 08:59 PM. very good mid head gear with orc hero card combo. Edited by zx56vb, 15 December 2018 - 03:06 PM. when dealing physical damage while under Frenzy state, has a chance to gain Atk + 1000 and transforms into Seyren Windsor (Lord Knight) for 5 seconds. 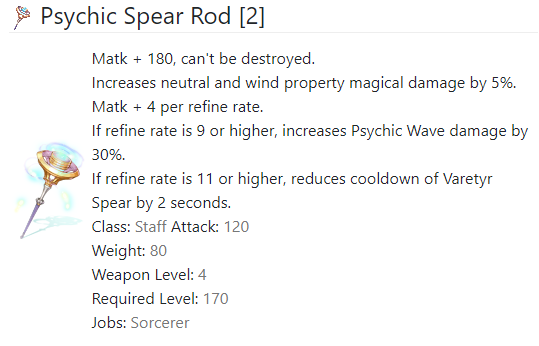 Matk + 5, reduces delay after skill by 1%, increases magical damage against water, shadow, ghost and undead property monsters by 2% per refine rate. if base level is 100 or higher, Matk + 15 and reduces casting time by 7% per refine rate. The Question: will we get HP+34% when we have 125 vit which the refinement rate at 9? Mdef + 5, MaxHP + 5%. Def + 50, Mdef + 5, Vit + 5, Attack Speed + 5%, reduces damage taken from players by 3%. If base Vit is 108 or higher, additional Def + 50, Mdef + 5, Vit + 5, Attack Speed + 5%. If base Vit is 120 or higher, additional Def + 100, Mdef + 10, Vit + 10. Edited by Rmon, 16 December 2018 - 04:11 PM. The sword allowed to have. It was lost now. Even if you are a master It is said to be extremely difficult. A person with a willing will With this, everything I say that it will reject difficulties. Edited by Vladdin, 17 December 2018 - 08:04 AM. Edited by Vhaaaan, 20 December 2018 - 05:06 PM. Edited by Sigma1, 18 December 2018 - 04:49 AM. is that from some event or Ragcan?